Hey, How About Us Fingers? Geez! Fingers are servants to the entire body and universe, they scratch where the universe itches, write down the thoughts and poems of brain and soul, pick fruit and flower and lint, and point out bears and lions and heroes of the constellations at night. They explore the jungles of lovers, the rivers, volcanoes, laplands, and saharas of their vastnesses, opening flowers and melons and seedpod for the soul and loin. They test for heat and cold and wet and dry and enemy and friend, tend to wounds on the body they work for and others they love, sketch the air with emotion and didactics. They cradle small living things and pieces of old life and new they find, and bring these treasures to the lips or heart or mind they give away free. They are born to serve and bring unto us everything we can imagine, and introduce us to what we never imagined. So they are creators too, weaving us matter-of-factly into tapestries of adventure our brains are a bit too contrived to. Fingers have ten individual souls working at the weaving rack of our lives, playing our lives like harpstrings or keyboards, our brain just the plainsong of right and wrong. True, fingers are in service to mind and brain, but they are masters of our expressed happiness. They do what has to be done and wave away what mustn’t, they unite in prayer and ring-around-the-rosies, they slip bands of love onto others’ fingers to wear as ID of belonging to something or someone, they slip into infant mouths as creators of peace, and adult mouths as invitations to paradise. Our toes balance the known universe with the feet, our fingers the universe of our desires with the hand. Our hands nailed Christ to the cross, but our fingers wrote his story and passed along his love. 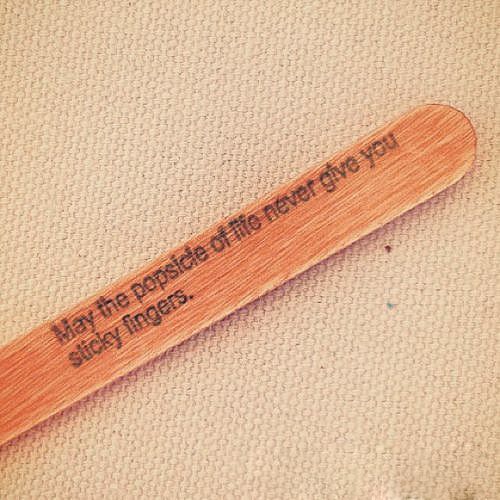 may the popsicle of life, never give you STICKY fingers. Fingers, where the orchestra of the Universe has a chance to pass its unified song. And for fingers to receive that unified song. Love these, fingers.